When Pavol first came to the course of the 3100 mile race last year, he knew he belonged here. At the time, he had just come to help, and perhaps explore the map of his destiny, within himself. It was only in this sacred place that he could challenge his desires and look directly into his heart's dream, to see if he had what it would took, to step up to the starting line himself. The moment he sat in his airplane seat to return home, while the race was still going on, he experienced a flood of emotions. It was clear from the tears in his eyes to the thrill he felt in his heart, that he would come back here again this year, and this time run himself. Over the last 55 days he has not regretted for one minute his decision to be here. His body has not cooperated as he would like but his heart and spirit has risen to every challenge and remained steadfast and dedicated to this Everest of distance races. When he saw the summit of 3100 miles slowly slip inexorably from his grasp he found a new and still lofty height to reach, 2700 miles. A distance still gargantuan compared to any mileage he had ever run before, and, as it turns out the distance this race once was, back in 1996. Today he will stand at the starting line just 33 miles from this goal. The expression, heroic effort, fits all those who come to this place and attempt to run 3100 miles. Most, but not all, make this distance, because they have been inexorably drawn here to fulfill an inner hunger and they willingly offer themselves up, to an inner call which has beckoned them on. Whatever capacity they have, is tested, challenged, and compelled to do battle with all manner of foes. Whether it be, in the deficiencies of their bodies or just plain old skirmishing with the jagged thoughts, lurking in their minds. In Pavol's case his body has given all that it has to give and then some. He will cross the finish line at a lesser distance, but can still wear with pride the certainty, that he is victorious in what matters most. Pleasing his inner being and the teacher who taught his heart to run far, farther, farthest. It is the start of day 56, the second last day of the race. There are many fewer chairs waiting for someone to come and sit in them now. But as much as the small race camp is lacking in human inhabitants, it is abundantly clear that it is not over. At least not just yet. The atmosphere is steeped with a subtle and yet powerful energy. Pavol arrives one last time. He stands on the line this morning with the knowledge that he has reached a new height both outer and inner. His body has done battle here but his heart has been singing nothing but celestial songs of praise and gratitude. Tomorrow will belong to no one else but Suprabha. Being in the presence of this young Slovakian runner one cannot help but feel dwarfed by his presence. At a height of 185 centimeters, which is well over 6 foot, he has towered over most of his fellow runners. Yet when you are in the presence of his lofty poise and calm demeanor, he seems to move forward with an even greater inner height. He has only been able to walk, for at least the past 2 weeks, which most runners say is the most difficult on the mind and body. In that same time he has never completed more than 50 miles a day, and yet by his fortitude and persistence he is now poised to complete his race. It is with genuine gratitude, he tells me, "I will finish 2700 miles today, but it feels like I have finished 3100 miles. These have been the best days of my life, these past 55 days." It has to be almost incomprehensible, to most observers of this race, that even anyone can stay out here so long, suffer so much, and yet continue on. Imagine than the courage it had to take to continue in the face of incontrovertible odds that he would not be able to finish the 3100 miles. He says of this, "No day did I want to stop. I did not think this." I tell him, that his experience here, reminds me of a famous marathon story from the Mexico Olympics. It is a tale of a triumph of the spirit. 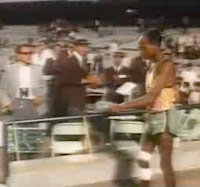 It is what happened to a young Tanzanian runner during the race 40 years ago, this month. How he was injured by a fall, and yet continued on. His finish now made famous by this video. Pavol do es not complain, as he describes a lengthy list of physical ailments that have dogged not just his steps here, but also before he came to the starting line. His left knee was not in great shape even before he left Slovakia. Since the start, he has had problems as well, with his other knee, and his feet, stomach, and muscles in his legs. Problems that would have kept most people in bed in the mornings, and yet he would still get up, and walk more than 40 miles a day all summer long. Despite this all, with his inexhaustible optimism he says, "next year will be different." He tells me that in the days and months leading up to the race, he was always preparing himself for it. But he did not look upon it, as just as completing 3100 miles. Rather, he took it to be a grand and challenging inner experience, he had to accept. He says, "Outwa rdly it looks like a race, but it is a serious journey to realize myself and God." He says this with certainty, because he believes wholeheartedly that his spiritual teacher, Sri Chinmoy, put so much emphasis on it. He says, "Guru was all the time here. This is his favorite race. He is still here." He has felt the presence of his teacher many times over the weeks he has been here. He says he even saw it in the smile of a fellow runner once, very clearly. He says that even when he would look at the children in the playground. He says, "sometimes when I looked into their eyes I saw Guru's eyes." He has been inspired to write poetry during the long hours he has run. He gladly recites one of his poems for me. This race is God himself. For one who has endured so much here, it occurs to me it is divinely ironic for him to say, without a hint of self indulgence, "all that we see is an illusion. It is what we feel that is important." Of Suprabha, who still shares the course with him he says simply, "she is God." It cannot be surprising then for him to love this place so dearly with not just his body but his heart as well. He says, "This place is my home." He tells me, with the utmost sincerity, "I don't know what I would do, without Parvati's group." The rest of the world continues on this Saturday, as usual. But what was not usual, and was in fact quite extraordinary, is that 3100 mile finisher Petr ran the 2 mile race this morning. He followed quite closely in the footsteps of a fellow competitor from last week, Ashprihanal. Petr ran just a little slower for 2 miles, with a time of 12:57. Like his Finnish friend however, he took 3rd place as well. I haven't said much about the cooks in a while, but they have been performing miracles hourly it seems, these past 56 days. Nirjharini and her crew have cooked selflessly all this time. They have been the engine that fueled the runners stomachs and their joy has been felt and appreciated in every tidbit and every gourmet platter. He crosses the finish line after being on this course for 55 days, 12 hours, and 28minutes. He has completed 2700 miles, which is self-transcendence even if you compare it, just to the yardstick, of his previous greatest mileage, 636 miles. His is a true victory, for both his outer and inner accomplishments. And if there were still, even a ghost of a regret, haunting this 32 year old Slovakian at the finish line, it is quickly illuminated. The girls, in their clever cleverness have located a 2700 mile song composed by Sri Chinmoy in 1996, at a predecessor of this race.